will grow and grow and grow. Last year, a teacher I met told me about how her class works with high frequency words during whole group and chooses students to be “Sight Word Masters.” Periodically, a sight word is chosen and placed on the word wall, and connections are made to this word in songs or poems during shared reading. 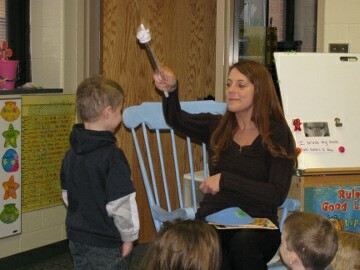 Then a child is chosen to be the “Sight Word Master” for that word. 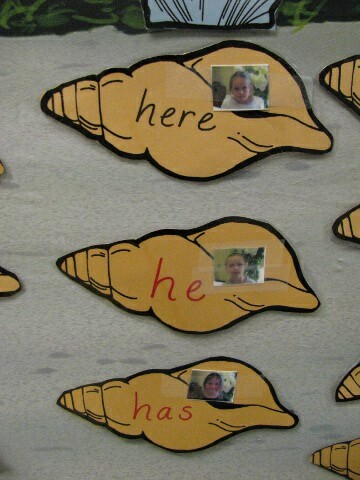 The teacher adds this child’s photo beside the word on the word wall and says, “By all the powers invested in me as your kindergarten teacher, I now pronounce (or dub) you the master of the word _______.” Kids love this part! 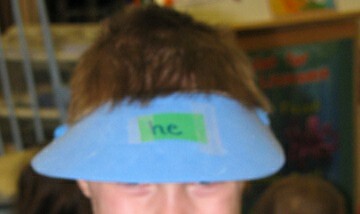 If the student has become the master of the word, he gets to wear a visor with that word on it for the rest of the day. As the class leaves and/or enters the room, all the students have to spell that word. A special thanks to Gretchen Longfellow of Brookston, IN for sharing this idea and her photos with me.